The second annual session of the United Nations Economic Commission for Africa (ECA) opened in Tangier today. During the two-week meeting, the members of the Commission will consider the economic development of the African countries. 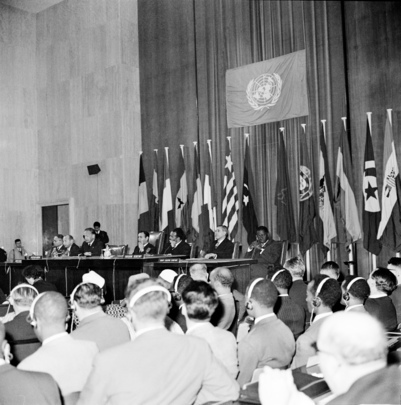 UN Secretary-General Dag Hammarskjöld addresses the meeting. At the table, from left to right, are: Ralph J. Bunche, UN Under-Secretary for Special Political Affairs; Philippe de Seynes, UN Under-Secretary for Economic and Social Affairs; Mr. Hammarskjöld; H.R.H. Moulay El Hassan, Crown Prince of Morocco, Mekki Abbas, ECA Executive Secretary; Abderrahim Bouabid, Minister of Finance and National Economy of Morocco, R.K. Gardiner, ECA Deputy Executive Secretary.